Their grafted vines, Chardonnay in particular, were an instant success, and the Shiraz ironically sold to Hardy Wines, Geoff’s family wine company, to make port, in exchange for some wine as payment. A far cry from today when Pertaringa’s old Shiraz and Cabernet vines make two of the finest full bodied reds of the region. Pertaringa is a hands on boutique wine company where all the staff are dedicated professionals concentrating on producing the highest quality grapes from low yielding vines and wines of truly exceptional quality. Much of the estate's fruit is highly sought by many of Australia’s leading wine companies for their award winning wines. Each individual Pertaringa Wine is made from select parcels of the best fruit from each variety grown in the vineyard. In 1990, Geoff and Ian won the first South Australian Vineyard of the Year award, worthy recognition of their combined efforts. In 1997 a cellar door was added to the vineyard complex making a visit to the vineyard, today, even more rewarding. Pertaringa wines have now found their way to Europe, North America and Asia where they have received much recognition. 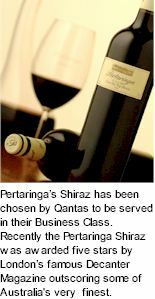 Pertaringa’s Shiraz has been chosen by Qantas to be served in their Business Class. Recently the Pertaringa Shiraz was awarded five stars by London’s famous Decanter Magazine outscoring other Australian Premium Shiraz such as The Eileen Hardy, The Armagh, Grant Burge Meshach and Rosemount Balmoral. Pertaringa Vineyards lies in the foothills of the Mount Lofty Ranges, the perfect location for grape growing with the temperate environment and the deep clay and loam soils. The soils, which are overlaying with small pebbles, provide good drainage and water retention properties. The use of weather stations and moisture monitors enables us to maintain a level of controlled stress on the vines. This technology tells exactly when the vines need water for their important growing periods, primarily during flowering, fruit set and verasion. The vines are trellised according to the specific needs of each variety. Most of the varieties are two-wire vertical shoot positioned while some of the others are three-wire vertical shoot positioned. This is done to make it easier to harvest as well as create the ideal microclimate for the berries. All the vines are pruned in order to control vigour and crop levels using a combination of hand pruning and mechanical pruning depending on the variety. In the summer the vines are topped and trimmed cutting the shoot tips off to encourage lateral growth and make the vines easier to access. Pertaringa Vineyard is surrounded by magnificent stands of native gum trees. Staff at Pertaringa, together with volunteers from Greening Australia's Bushcare have planted native trees and have revegetated and rehabilitated the creek that runs through the vineyard. Other environmentally minded decisions made at Pertaringa are to include Integrated Pest Management to pests. An example of this is to use bacteria, rather than insecticides, and the use of Seaweed with other natural sprays is used as alternatives to chemical based sprays. Harvest is the busiest time of year in the vineyard. Berry and bunch sampling with lab analysis let us know when the grapes are ready for the specified wine style. Irrigation is reduced to the bare minimum allowing the varietal flavours to intensify. Most of the grapes are machine harvested, and always at night to ensure swift delivery to the winery during the coolest hours of the early morning (minimising oxidation). The vineyard management at Pertaringa guarantees the highest quality grapes for all the grape buyers. This is evident with the continual demand for the grapes from Pertaringa Vineyard from Australia's top wine producers. The vineyard manager and the winemaker select premium parcels of the vineyard for the Pertaringa Wines, ensuring that each vintage will be of the highest quality.